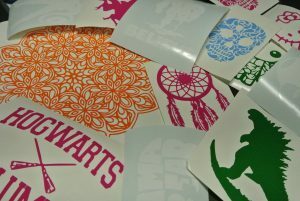 We carry an indoor/outdoor Vinyl decals that we use to make all our projects. Therefore, they can be placed on Vehicles, Walls, Glass, electronic devices, and more. Additionally, we carry a variety of colors including white, black, blue, green , pink, orange, and more! contact us for more information regarding custom vinyl cutting.